A lovely quote by T.S. Eliot. The person who designed this lovely poster misspelled his name so I have edited it out (a lesser crime than mine as I pinched this off of Pinterest). 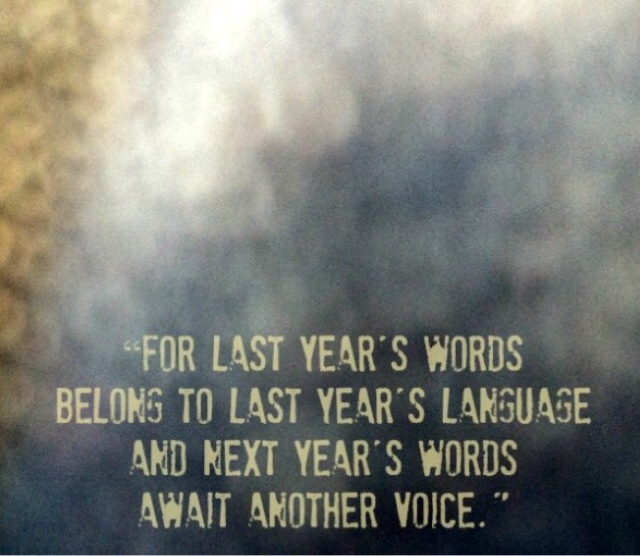 So I start this year with a theft of words that summon up that desire for newness, the hope that there is hope and second acts and third chances. Amen to that and here's to a blessed new year. Ah, the complications of theft! ...and fourth chances, and -- the mercies of God are new every morning. Our priest said don't bother with resolutions, unless it is one: to repent every day. I'm going to be thinking about the languages and voices. Thank you for the quote, and for all your editorial work. I wouldn't have liked to see it the other way!